When looking for stone flooring for your home, you knew that you wanted tile that looked a little rustic and "old world," something with character and charm. You loved the look of travertine but had never found the right version until you came across Noce Premium Versailles Pattern Travertine. Featuring creamy shades of tan, gold and ivory, Noce travertine tile is the perfect neutral base for every room in your home, yet still has visual interest with light colored clouds and veining throughout. The tumbled finish on Noce travertine tile gives the flooring a smooth texture with the smoothness of polish and the natural feel of tumbled. This tile can also be made into a Versailles pattern for a more intricate flooring choice. After your Noce travertie tile is installed, you smile and are glad that you waited so long to find the perfect match. 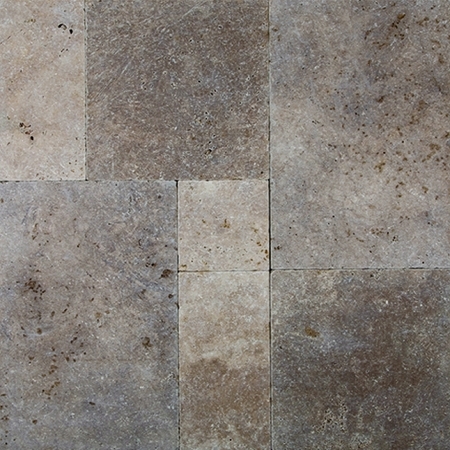 Noce Premium Versailles Pattern Tumbled Travertine tile works great in areas such as your bathroom, kitchen, and living room. Whether it is an outdoor or an indoor application, this versatile tile can fit most needs.